Volunteers are the heart of Essence of Life Hospice. If you have a desire to give back to the community and make a difference in people’s lives, then join the Essence of Life Hospice volunteer program. Companionship for patients – Visiting, playing games, reading, listening. Relief for caregivers – Providing a much needed break for a spouse, child, or a loved one caring for the patient. Other duties – Running errands, light housekeeping, walking the dog, yard work. Contact us today! Print out our Volunteer Application and make a real difference in the lives of people in our community. Note: Successful completion of our 14 hour training program is required prior to becoming an Essence of Life Volunteer. A minimum of two hours of inservice training per quarter is required to remain an active volunteer. Donate to our Memorial Fund or our Living Dreams program, a program to assist our patients in making every day count. Note: Clicking the Donate button below will take you to PayPal. You do not need a PayPal account to donate. All PayPal donations are processed securely online. You will receive a confirmation message once your donation has been processed. 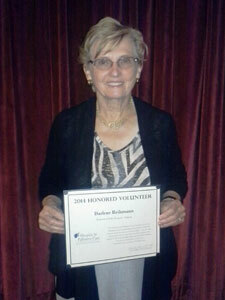 Darlene Reihmann, Essence of Life Hospice volunteer, was recognized for her volunteer work at the Hospice and Palliative Care Association of Iowa Volunteer Recognition Ceremony. The ceremony took place on September 5th at Prairie Meadows Conference Center in Altoona, Iowa. Mary Hall with HCI Care Services opened up the ceremony with a talk on “Who Cares? Caring for the Caregiver.” Live entertainment of 50’s and 60’s music was performed followed by a meal and then Mary Kay Shanley, author and speaker, presented “A Pearl in the Hand.” The recognition ceremony completed the event. Darlene has been a volunteer with hospice for over 6 years serving patients in Iowa County as well as each county surrounding Iowa County. Darlene has outstanding qualities that make her a great hospice volunteer. She is willing to help any area in need including patient visits, office work, baking, and helping with memorials and fundraising events. Darlene has had a busy and, at times, a rough past year but she has shown her love and passion for volunteering by rarely turning down an opportunity and always showing up with a smile. 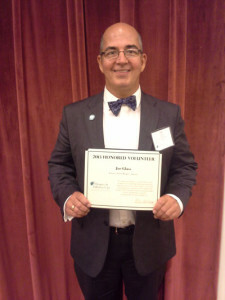 Joe Glass, Essence of Life Hospice volunteer, was recognized for his volunteer work at the Hospice and Palliative Care Association of Iowa Volunteer Recognition Ceremony. The ceremony took place on September 13 at Prairie Meadows Conference Center in Altoona, Iowa. Dale Larson, Professor, Counseling Psychology, Santa Clara University, opened up the Ceremony with a talk on “The Helper in Us All: Hospice Volunteers and the Helper’s Journey.” Followed by a meal and recognition ceremony. Joe has been a volunteer with hospice for over 5 years serving patients in Iowa County as well as each county surrounding Iowa County. Joe has outstanding qualities that make him a great volunteer. He has an outgoing personality and is willing to help out whenever needed, from patient visits to helping with community events and administrative duties. Joe is passionate about making each moment count for our patients as we strive to make each day the best. Joe shows his passion for volunteering by juggling a busy schedule of school, work, and still allowing time for volunteering. We are so grateful to have him a part of our team as he brightens so many patients’ and families’ lives.